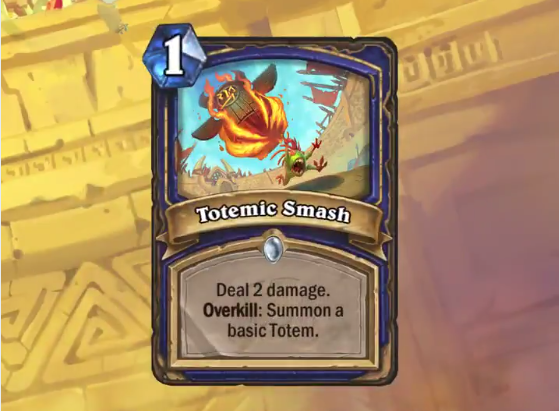 Cheap spells are always ones to look out for and Totemic Smash seems decent, without being anything exceptional. Totemic Smash doesn't Overload you like Zap! (plus, it can go face) and it has the potential to summon a basic Totem if you Overkill a minion, which is an alright deal for 1 mana. It certainly can fit into a Malygos deck - the same way Holy Smite is used for OTKs - although in that case the Overkill text isn't that relevant. There is a reason why Arcane Shot only found a slot in some variations of Spell Hunter and Holy Smite is only used for OTKs. A 1-mana deal 2 damage spell is certainly not a bad card, but its use is probably limited. Lightning Bolt is better and it synergises with Shaman's various Overload mechanics, like the new Likkim weapon. Check out our Rastakhan's Rumble hub for all the cards revealed from the upcoming expansion.